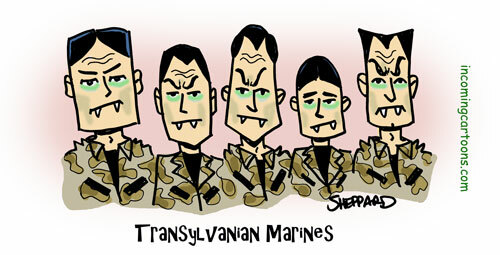 Home of the vampires or not, every country needs a good Marine force. Thank you for stopping by the site. Enjoy the Super Bowl and may the best team win … Go Pats!!!!! Be safe out there. This entry was posted on Friday, February 1st, 2019 at 12:00 am and is filed under Cartoons. You can follow any responses to this entry through the RSS 2.0 feed. You can leave a response, or trackback from your own site.